How to make your own Tzatziki: Cucumbers are one of the joyous foods of summer. I remember quite clearly a neighbour of ours when we were children who was so proud of his new harvest from within his new greenhouse, he promptly delivered a pile of them to us. Those days (many, many years ago), cucumbers were regularly were served up in salads or less regularly sliced ever so thinly, placed onto some crust-free, lightly buttered, white bread, sprinkled with a soupçon of salt and presented as a High Tea sandwich. OH MY, how times have changed. 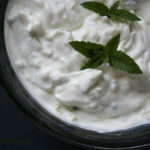 Today our food choices take us all over the globe and in the case of Tzatziki, Greece. 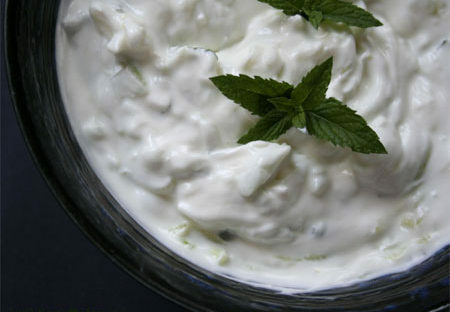 Tazatziki sauce is used as a dip, accompaniment to spicy main dishes and is very similar to the Indian yogurt and cucumber sauce known as Raita. We hope to bring you that delight in another recipe. Although Tzatziki has a few simple ingredients, the trick with it is patience. This sauce is the texture of dipping sauce when finished but if you don’t take the time to drain the yogurt and the cucumbers you will end up with something more like a smoothie! 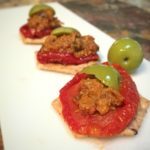 You will need up to 2 hours of fridge time and a few minutes of preparation time. 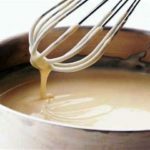 Using a cheesecloth or very fine sieve, drain the yogurt for up to 2 hours. During this time prepare the cucumbers: peel, halve along the length, scoop out the seeds and dice into a colander. Place the colander into a bowl so that the bottom it does not touch the base of the bowl. Sprinkle the diced cucumber with sea salt and place a weight over them (I had to get creative put a large melon in a bag and placed that over the top). Now put the cucumber into the fridge with the yogurt and wait. When 2 hours has past, first deal with the cucumber. You will need to get it as dry as possible. I put mine into a spinner then pat with kitchen paper. Place the dried cucumber into the bowl of a food processor with the dill, garlic and lemon juice. Then pulse until the cucumber is lightly chunky. Using a slotted spoon, add the drained yogurt into a mixing bowl with the cucumber mix, draining through the spoon where necessary. Mix and check your seasoning adding more garlic, lemon juice, salt or dill as required.